R. Carter Hill has a BA degree in Economics from Duke University, a MA degree in Economics from Western Illinois University and a Ph.D. in Economics from the University of Missouri-Columbia. He taught at the University of Georgia from 1975 to 1985 and has been at Louisiana State University since 1985. He is an Emeritus Professor of Econometrics. He has published over 70 scholarly papers. He is coauthor of several textbooks, including Principles of Econometrics, 5e (Wiley, 2018). He is a Senior Co-editor of the research annual Advances in Econometrics (Emerald Press). Click here for full vita. 2009-present: Thomas Singletary Business Partnership Professor of Economics, Louisiana State University. 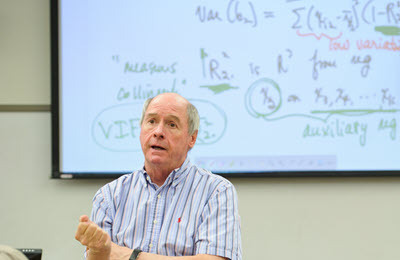 2007-present: Ourso Family Professor of Econometrics, Louisiana State University. 2013: Tiger Athletic Foundation Excellence in Undergraduate Teaching Award, Louisiana State University. 2004: Tiger Athletic Foundation Excellence in Teaching Award, Louisiana State University. 1997: LSU Foundation Distinguished Faculty Teaching Award, Louisiana State University. 1996: E.J Ourso College of Business Administration Most Valuable Player, Louisiana State University. 1994: Tiger Athletic Foundation Excellence in Teaching Award, Louisiana State University. 1989: LSU Alumni Association Distinguished Faculty Award, Louisiana State University. Campbell, R. C. & Hill, R. C. (2006). Imposing parameter inequality restrictions using the principle of maximum entropy. Journal of Statistical Computation and Simulation, 76 (11), 985-1000. Hill, R. C., Knight, J., & Sirmans, C. F. (1997). Estimation of Capital Asset Price Indexes. Review of Economics and Statistics, May, 226-233. Deis, D. & Hill, R. C. (1995). An Application of the Bootstrap Method to the Simultaneous Equations Model of the Demand and Supply of Audit Services. Contemporary Accounting Research, 15(1), 83-99. Kim, M. & Hill, R. C. (1995). Shrinkage Estimation in Nonlinear Regression. Journal of Econometrics, 66, 1-35. Hill, R. C. (1994). The Statistical Properties of the Equity Estimator. Journal of Business and Economic Statistics, 12, 141-149. Hill, R. C., Cartwright, P., & Arbaugh, J. (1991). The Use of Biased Predictors in Marketing Research. International Journal of Forecasting, 7, 271-282. Hill, R. C. & Judge, G. G. (1990). Improved Estimation Under Collinearity and Squared Error Loss. Journal of Multivariate Analysis, 32, 296-312. Judge, G. G., Hill, R. C., & Bock, M. E. (1990). An Adaptive Empirical Bayes Estimator of the Multivariate Normal Mean Under Quadratic Loss. Journal of Econometrics, 44, 189-213. Griffiths, W. E., Hill, R. C., & Pope, P. (1987). Small Sample Properties of Probit Model Estimators. Journal of the American Statistical Association, 82, 929-937. Hill, R. C. & Judge, G. G. (1987). Improved Prediction in the Presence of Multicollinearity. Journal of Econometrics, 35, 83-100. Hill, R. C. & Ziemer, R. (1984). The Risk of Stein-Like Estimators in the Presence of Multicollinearity. Journal of Econometrics, 25, 205-216. Fomby, T. B., Hill, R. C., & Johnson, Stanley. R. (1978). An Optimality Property of Principal Components Regression. Journal of the American Statistical Association, 33, 191-193. Hill, R. C., Griffiths, W. E. , & Lim, G. C. (2018). Principles of Econometrics, 5th Edition, New York: John Wiley and Sons, Inc.
Judge, G. G., Hill, R. C., Griffiths, W., Lütkepohl, H., & Lee, T. C. (1988). Introduction to the Theory and Practice of Econometrics, 2nd Edition John Wiley & Sons, Inc.
Judge, G. G., Griffiths, W. E. , Hill, R. C., Lütkepohl, H., & Lee, T. C. (1985). The Theory and Practice of Econometrics, 2nd Edition John Wiley & Sons, Inc.
Fomby, T., Hill, R. C., & Johnson, S. R. (1984). Advanced Econometric Methods Springer-Verlag .